Al Marjuk holds MSc in Social and Cultural Research from Brunel University, UK and a bachelor degree in sociology from the University of Dhaka. 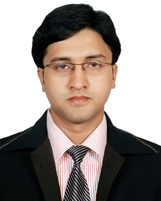 He started as a Lecturer of Sociology at Asian University of Bangladesh in 2012. Before that he worked as a Research Intern at Policy Research Centre, UK. He joined IUB in December 2012 and currently serving as a Senior Lecturer in the Department of Social Sciences and Humanities at Independent University, Bangladesh. Beside teaching sociology and philosophy Mr. Marjuk is playing the role of Additional Director at Institutional Quality Assurance Cell (IQAC) of IUB and of Deputy Sub-project Manager (DSPM) in a HEQEP-funded sub-project titled "Pedagogical Development at Undergraduate and Master's Level". His area of interests includes community, digital divide, education, eschatology, gender studies, globalization, Islam, pedagogy, permaculture, rural sociology, social history, social networking, sociological theory, and western thoughts and philosophy. Mr. Marjuk has over six publications in journals and as book chapters. He has also written over three research and evaluation reports on pedagogy and education. He visited more than 18 countries for academic purpose and established some collaborative projects between IUB and a number of universities in Europe and in the US. He is the Organizing Secretary of two international conferences that take place every year at IUB.